MOSCOW, Russia, April 29, 2014 (ENS) – Riding on his pride in the first export of Russian Arctic oil earlier this month, President Vladimir Putin has signed a law that allows oil and gas corporations to establish private armed security forces to defend their infrastructure, upping the ante for protestors. He said Russia is fully compliant with international requirements for enhancing environmental security in the region, and will rectify “consequences of accidents in hydrocarbon production on the marine shelf” within the framework of the Arctic Council, an intergovernmental forum of the eight Arctic Circle nations. The Arctic as a whole is believed to hold one-third of the world’s remaining undiscovered oil and gas resources, most of them located offshore. On April 18, Gazprom loaded the first cargo of oil produced from the Prirazlomnoye field, presently the only Russian hydrocarbon development project on the Arctic shelf. 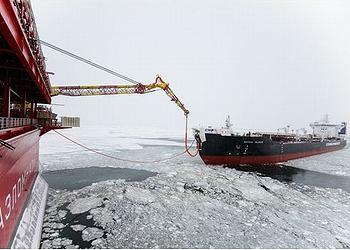 Demonstrating the importance of Arctic oil exports to Russia, President Putin gave the command by phone to start loading the first shipment of Arctic oil onto Sovkomflot’s specially designed ice-class tanker, the Mikhail Ulyanov. The shipment is on its way to Russia’s first customer, the French company, Total, the international nonprofit organization Greenpeace revealed. Miller emphasized that the design of the Prirazlomnaya platform secures every process operation, excluding the chance for any oil spills during the production, storage and loading processes. A wet method of oil storage used at the platform eliminates the possibility of oxygen getting inside the tanks, creating an explosive environment, according to Gazprom. Special equipment was developed for transfer of the oil to tankers for transport. “To avoid accidental oil spills, the loading block system goes off in seven seconds at most,” said Gazprom. But Greenpeace is not reassured that Arctic oil development is safe from spills and certainly not from the effect of burning that oil on the rising planetary temperature. To alert the public to these dangers, last September Greenpeace staged a high profile protest at the Prirazlomnaya platform in the Pechora Sea. Russian authorities arrested 28 Greenpeace activists and two freelance journalists, known as the “Arctic 30,” who tried to hang a protest banner from the platform. They were imprisoned for over two months on charges of piracy and hooliganism and freed only following a global outcry and a ruling by a Law of the Sea Tribunal. Now, with the new Russian law in place allowing Gazprom and other companies to assemble their own armed security forces, such protests carry an even higher risk for activists. But it is not only environmental activists that Russian officials worry about. Dmitry Yarosh, a Ukrainian nationalist, presidential candidate and leader of the far-right group Right Sector, threatened last month to blow up pipelines leading from Russia into Europe if a diplomatic solution is not found for the Ukraine-Russia conflict. Putin is taking such threats seriously, placing Yarosh on an international terrorist list. To stay ahead of other nations in the Arctic his government is “reviving the Northern Sea Route,” tripling cargo transport along the route over the past few years. “We have to make sure shipping companies find it profitable and convenient to fly the flag of Russia, so that the bulk of cargo shipments in the Arctic, particularly along the Northern Sea Route, is conducted by vessels under Russia’s jurisdiction,” Putin told the Russian Security Council meeting. 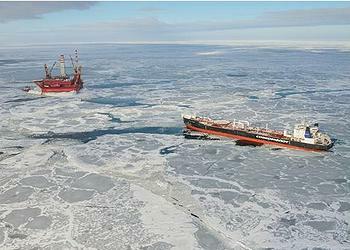 Russia needs to legally formalize the outer boundary of Russia’s continental shelf in the Arctic Ocean. At the March session of the UN Commission on the Limits of the Continental Shelf, Russia spoke of its right to part of the Sea of Okhotsk that was earlier considered open, “a 52,000 square kilometre area, the bottom of which is the continuation of Russia’s continental shelf,” Putin said. The UN Commission agreed with Russia and recommended that Russia’s boundary include this area. Putin said his government “should hold on to every area of the Arctic continental shelf of Russia and its marine basins.” Other Arctic governments are doing the same; the race to secure Arctic territory is on. 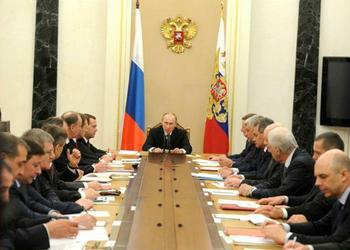 Finally, Putin spoke of environmental security. “Prirazlomnaya, which I have already mentioned, has zero waste. This means that we are capable of implementing projects of such quality, and this should become [the] norm,” Putin said.